One criticism that I've seen with Disney Infinity is that it's too contemporary. At launch, we got three Pixar films, a Pirates of the Caribbean world, and a Play Set for the brand new Lone Ranger reboot. Although classic franchises like Aladdin and Little Mermaid are lumped in with the free roaming Toy Box mode in the form of collectibles, a lot of people were left wanting more than just a Pixar game, which is a fair point. 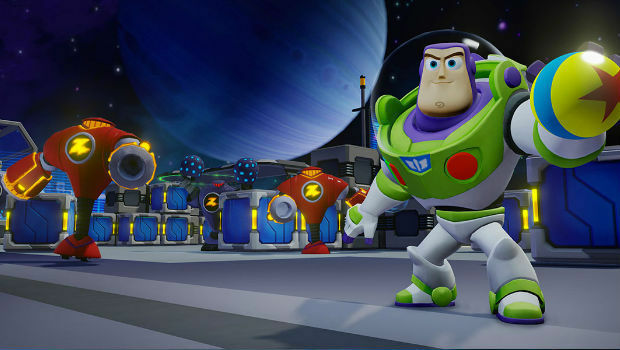 But that time still hasn't come, as Disney has launched the newest Toy Story-themed world for Disney Infinity, in yet another Pixar-based offering. The good news is that it's actually pretty fun, despite retreading familiar territory. You know the drill by now. Each Play Set includes two new characters, and a new DLC campaign. This time you're getting Buzz and Jesse (sadly, Woody is sold separately, which is a major bummer), and the world itself is based off of Buzz Lightyear's Star Command universe, with a few Toy Story characters stuck in for good measure. Although one might think this is going to be an epic campaign against the evil Emperor Zurg, that's not really the case, as Zurg's forces are relegated to a "Combat Simulator" area within the DLC itself in favor of a more low-key space setting. It's a bit of a disappointment for sure, but Wallace Shawn and John Ratzenberger return to voice Rex and Hamm respectively, and it thankfully has a solid amount of charm to it in its own right. So without Zurg to battle, what are you actually doing? Well, Toy Story in Space is a cute romp through a galactic setting, filled with those loveable (but possibly over-saturated) "eternally grateful" aliens, as you attempt to save them from natural disasters like a raging space volcano. I generally find it really hard to dislike anything Toy Story related, so odds are you won't find much to complain about here as you trek across uncharted territory, discovering new forms of life, and solving alien-sized problems. This Play Set has jokes, ladies and gentlemen, and although they usually teeter on the cheesy side, I couldn't help but crack a few laughs throughout my time with it (Wallace Shawn is pretty much great in anything). As you progress through the straightforward campaign you'll unlock new items, like a jetpack that allows you to live out your wildest Buzz Lightyear dreams of flight, and other odds and ends like the iconic yellow and red Pixar ball. Similar to the Cars set, you'll also have the ability to engage in a linear city-building minigame as you assemble your own version of a Star Command Headquarters. But in order to do that you have to constantly hunt down and open building crates, which can lead to some tedium -- thankfully, you're free to leave the HQ area as often as you want, and explore the fairly large world at hand. Toy Story in Space's attempt to mix things up lends itself to a "big and small" mechanic, involving mysterious purple and green goo that allows a subject to become tiny or gigantic by taking a dip in the respective goo pit. The only problem with these sections of the world is that they're heavily designed around the mechanic, with very little freedom of exploration and movement. So while it feels cool to go all Alice in Wonderland at first, your options are extremely limited in where you can actually go. Having said that, most of the DLC's content is consistently fun. There are a ton of secrets to find (like eggs that can hatch into creatures), puzzles to solve, and tall platforms to climb. The starting area is also impressive in terms of scale, and the massive draw distance really shows off Disney Infinity's solid game engine. In the grand scheme of things, the jetpack and rocket packs are great, and are two of the best items in the entire game to carry over to Toy Box mode. Green and purple goo guns are also a go for the Toy Box, but their value wears thin after the first few times you shrink and grow your character. Buzz, Jesse, and Woody all translate very well in-game, but the physical Woody figure feels slightly off in quality, and I can't quite put my finger on it -- like it's a knockoff, or something. 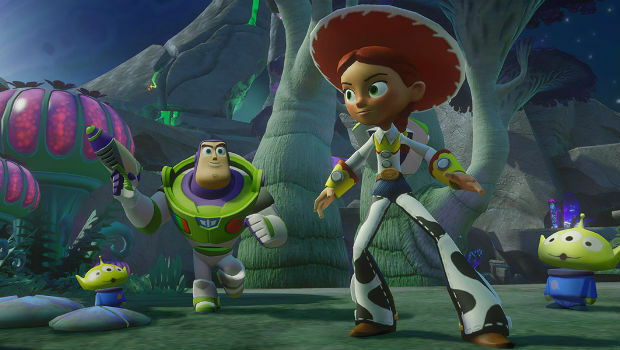 Toy Story in Space may not push the IP as far as it should, but it still offers up a solid action-adventure sandbox for gamers of all ages to enjoy. Although I wasn't blown away like I was with The Lone Ranger set, I couldn't help but keep a smile on my face as I blasted away robots left and right with Buzz and Woody.